21c Museum Hotels, the award-winning boutique hotel, contemporary art museum and restaurant group, has opened Lockbox, the restaurant and bar located inside 21c Museum Hotel Lexington (167 W. Main Street). Led by executive chef and 21c veteran Jonathan Searle, Lockbox showcases the chef’s commitment to the community’s craft purveyors, high-quality seasonal ingredients and thoughtful yet simple cooking techniques. Occupying a historic banking hall, Lockbox’s large windows provide plentiful natural light; marble floors, wainscoting and decorative plaster details serve as the backdrop for the contemporary furnishings and art that occupy the space. Both restaurant guests and passersby have an open view of the Lockbox kitchen, which features a custom American-made Jade Cooking Suite, allowing seamless collaboration between Searle and his team. Tomorrow’s Weather, an art installation by Stockholm-based duo Biegert & Bergström that changes color depending on the following day’s weather forecast, casts a playful glow over the intimate bar and lounge occupying the corner of Main and Upper Streets. Velvet drapery creates division between the dining room and the lounge. The bank’s original safe deposit vault remains intact and has been reimagined as an intimate private dining room. Searle began his culinary career at Lexington staples Bourbon n’ Toulouse and Bellini’s and returns to the city after a successful tenure at another 21c Museum Hotels restaurant -- Louisville’s Proof on Main, lauded as one of Bon Appetit’s “10 Best Hotels for Food Lovers.” His menu at Lockbox will highlight simple ingredients with a nod to Kentucky’s rich Southern heritage and Lexington’s own cultural and agricultural identities. His menu will change frequently, informed by the offerings of a deep network of local providers and the bounty of ingredients fed by Kentucky’s limestone-rich soil. “I love simple, soulful, thoughtful things done well, honest food that reminds guests of why we break bread together,” said Searle. 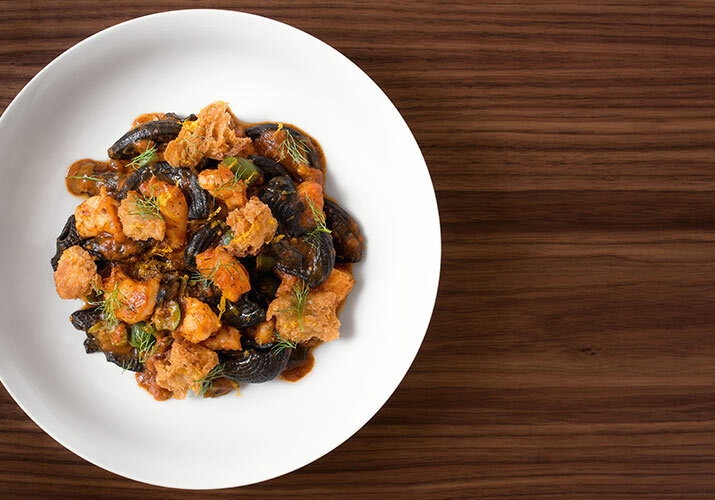 Searle’s menu features the bright and rich Squid Ink Macaroni, served with rock shrimp, Castelvetrano olives and a spicy tomato broth and Cornmeal Gnocchi with lamb neck ragu, green chili and buttermilk serves as an ode to the strong Mexican culture in Lexington. 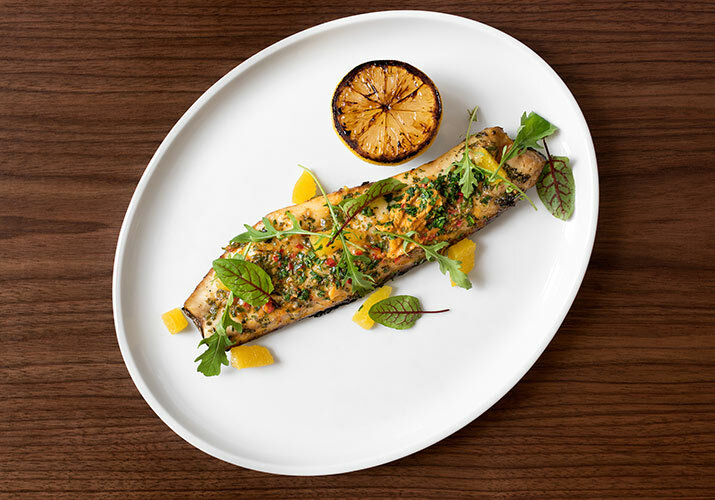 The oven-roasted market fish, rotating with seasonal availability, is served “on the half shell” – roasted scale-side down -- with a spicy chili butter and smoky, charred citrus. 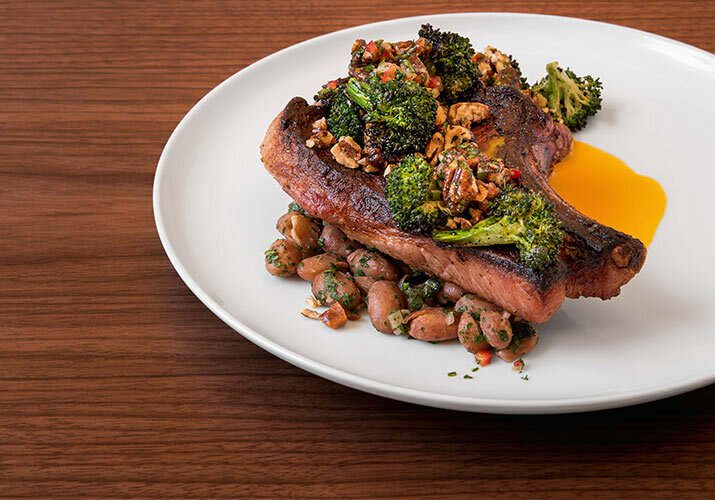 The Cast Iron Hog Chop features Woodland Farm-raised pork, served with roasted broccoli, pecans and squash mustard. 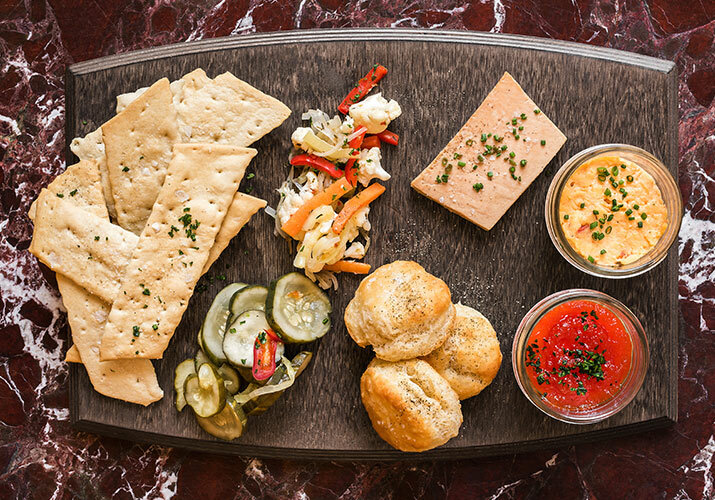 The simple In Jars, served with house saltines and buttermilk biscuits, includes Searle’s take on pimento cheese, pepper jam and chicken liver mousse, accompanied by pickled vegetables. The cocktail program too is designed with the Bluegrass region in mind, highlighting Kentucky’s native spirit with a broad selection of more than 60 fine Bourbons and Ryes. The cocktail menu rotates seasonally and offers both approachable aperitif cocktails and more complex spirit-driven cocktails. All spirits can be ordered in half ounce, 1.5 ounce or 2.5 ounce pours, encouraging trial and giving guests the opportunity to try new spirits and build their own flights. Lockbox features an extensive and approachable wine list focused on American and French wines, with a comfortable mix of familiar styles and labels complemented by more adventurous options. Lockbox will bring to Lexington the same genuine hospitality offered at all 21c Museum Hotels and Restaurants. This hospitality reaches beyond the restaurant and lounge, as Lockbox will provide catering and in-room dining for guests of 21c Lexington. Lockbox and 21c Museum Hotel Lexington, designed by Deborah Berke Partners, are located in the historic Fayette National Bank building at the corner of Main and Upper Streets (167 W Main Street) in downtown Lexington. The building was originally constructed as Lexington’s first skyscraper in 1913. To join the conversation, connect at Facebook.com/LockboxLex, and on Instagram @LockboxLex. For more information, or for reservations and hours, visit www.lockboxlex.com or call 859.899.6860.